or if you want to take along the grounds and brew it fresh. This is the perfect coffee travel companion. The coffee travel mug is made from double-walled stainless steel, which will keep your beverage hot or cold for an additional 6 hours. ONEISALL water bottle, like many great products, was inspired by a need. The need for a safe, sustainable and portable water storage solution. ✔[PERFECT ON-THE-GO MUG] - Each thermos travel bottle measures 5.9×2.95 inch, 400ml/13.5oz, this small thermos bottle perfects for most car cup holders and even take it on the go.So you'll never be thirsty in transit again! 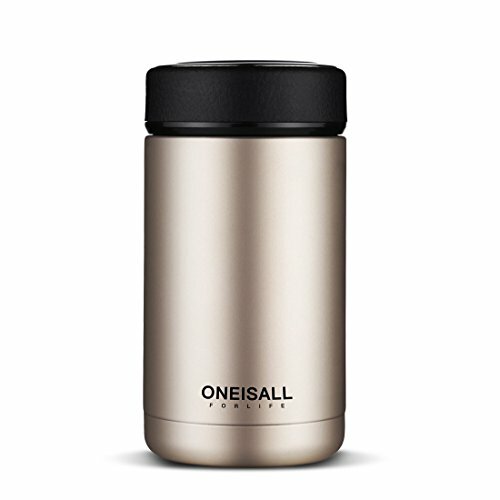 ✔[SAFE MATERIAL THAT KEEP DRINKS HOT&COLD] - Insulated coffee thermal bottle is crafted with high quality food grade double walled 304 stainless steel, heat-resistant, anti-corrosion, anti fouling, no nasty chemicals, no harmful toxics. Double wall insulation maintains hot or cold temperature of contents for a long time. Cold liquids stay cold for 12 hours without any condensation on the outside of the bottle. Hot liquids stay hot for 6 hours or above. ✔[LEAK PROOF LID] - This mini coffee thermos features an airtight spill proof screw on cap lined with rubber on the lids inside to create a vacuum seal, so you can throw it in your kids sports bag or backpack for a hike outdoors, or take it to yoga class, without worrying about leaks. ✔[INCLUDES TEA INFUSER] - Tea drinkers rejoice! Safe and durable heated hydration storage bottle features a small removable infuser for loose leaf or regular tea bags, making it easy to brew or refill on the go - a unique and cute gift for mom or dad or anyone who enjoys tea outside the home. The travel mugs can come apart piece by piece so that you can easily clean the cap, seal filter and vacuum body to avoid smells and odors. Manufacturer: Huizhou Weifan Trading Co., Ltd. Publisher: Huizhou Weifan Trading Co., Ltd. Studio: Huizhou Weifan Trading Co., Ltd. If you have any questions about this product by All Is One, contact us by completing and submitting the form below. If you are looking for a specif part number, please include it with your message.